Not all petrol & oil companies issued their own road maps; some of the smaller ones could not afford to and so it made sense to consider advertising on other, commercial map issues. However, it appears that most adverts found on maps are nonetheless from the major brands of petrol - especially Shell, Esso, BP and Mobil. In particular, Mobiloil was a regular advertiser in areas where Mobilgas did not have service stations. Many early automobile maps carried advertising from businesses likely to be of use to motorists such as hotels, garages and occasionally petrol and oil companies. The example below is dated 1927 and described as "Automobilekarte für Ober- und Niederösterreich, Salzburg, Kärnten, Steiermark und Burgenland" - in other words the Western two-thirds of Austria. This slightly unusual territory is due it being produced by Universitäts-Verlag Wagner of Innsbruck in the Tyrol. As well as this map at the quite generous scale of 1:350,000, the company sold a map of the Eastern third of Austria (centred on Innsbruck) together with parts of Germany and Northern Italy. Cartographically it was quite simple, lacking physical features other than rivers, but marking gradients on roads in great detail. The map carried 20 panels of third party advertising printed directly onto the linen rear of the maps, (which would have cost Sch7 on linen and Sch4 on paper), as well as having a pasted rear cover advert. Two of the interior adverts were from petrol companies. David Fanto & Comp. noted that it had 25 petrol Straßenzapfstellen (streetside petrol pump outlets) in Vienna, plus others in all main provincial towns, that sold its "Fanto-Benzin" and "Fantolin" special motor oils. Although based in Vienna, Fanto was broken up after the war, with the Czech firm Paramo claiming to be its principal successor. Unusually both the other adverts came from suppliers of Shell products. An interior advert came from Tiroler Benzin- und Mineralölvertrieb Otto Gamper of Innsbruck, who promoted Shell's summer and winter lubricant grades. (Otto Gamper lived from 1893 to 1967, and later became Deputy Mayor of Innsbruck, but it not known what happened to his company.) The rear cover was used by "Shell-Floridsdorfer" Mineralöl-Fabrik of Vienna to guarantee the highest output from motors using their products. It is not clear if either company was directly controlled by Royal Dutch Shell, or if they were independent distributors of Shell products. Part of the Soviet Union between the Second World War and 1991, so subject to a national fuel monopoly and limitations on private motoring, Latvia (and the other Baltic States) soon liberalised their retail petrol markets, leading to a large number of petrol stations being built in the 1990s. Although some indigenous brands have been established, including Virši-A, Viada and Trest, the market is dominated by the international subsidiaries of Russia's Lukoil, Norway's Statoil (which acquired Shell's operations) and Finland's Neste. The map shown above to some extent typifies maps from the Baltic States and wider Eastern Europe. A commercial issue from Jana Seta Map Publishers, it covers the country at the scale of 1:500,000 and uses pleasing modern cartography with the reverse given over to an index and larger scale maps of the seven main urban areas. Typically for the region, all service station locations are marked - a throwback to the days when the Soviet monopoly had few retail sites. However, three companies paid to has their logo shown alongside their filling stations: Lukoil (the market leader), Virši-A and Uno-X. At the time the map was created in 2006, Uno-X was still owned by HydroTexaco, but later that year it was sold to Estonia's Alexela Oil (and subsequently to Lukoil in 2009). In the relatively few years since the map was published the market has changed significantly, with some of the poorly sited low quality stations built in the 1990s closing under the economic troubles of the late 2000s, and the more successful brands consolidating their position in the market, often through unmanned automat stations. So, for example, although only 24 locations are marked on the map for Virši-A, the company supplied 35 locations just 6 years later. 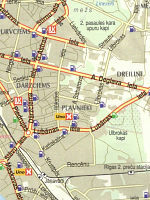 The map extracts above show the area around Jekabpils (where three Virši-A and a Lukoil are marked) and part of the city plan of Riga, showing two Lukoil and two Uno-X locations in the midst of a large number of locations. The map Legend does not explain the green petrol pump symbol, but it is likely that they are LPG sites. There are several adverts in the borders of the map, including one for Virši-A (but no other oil companies). 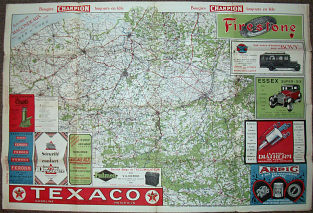 The Belgian company Polstobb produced a number of maps in the 1920s and 30s sold for 5 Fr, and often carrying Texaco advertising, as on the 1928 map shown above left. This map also located principal Texaco sales outlets by a star on the map itself and had a list of Texaco lubricant grades for commonly sold cars on the reverse as well as a large map of Luxembourg. By 1936 Shell was the principal petrol company advertiser, although its locations were presumably so numerous by then as to not require marking. 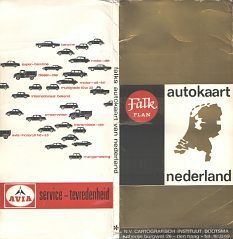 The reverse carried a large mileage chart and simplified line map as well as further advertising for "Mon Auto". Both maps were quite large (approximately 1120mm x 730mm) and carried a warning that if affixed to a wall they would need to pay an additional tax. They are shown here at around one third of the relative scale of most of the map covers, or about 10% of actual size when viewed on a typical PC. 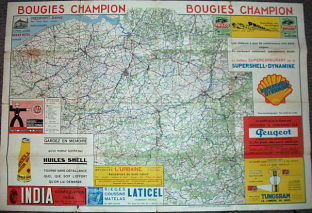 The Royal Automobile Club de Belgique (RACB) also regularly produced a rather basic map of the country showing little more than road conditions, numbers and distances. On the August 1936 edition, roads were split into five categories: bonne, passable, mauvaise, impracticable and barrée. A special symbol was used for locations considered very dangerous in the rain. Perhaps unexpectedly, roads were generally worse in Flanders, where there were still extensive stretches of cobbled "pavé", than in the less densely populated Wallonia region. 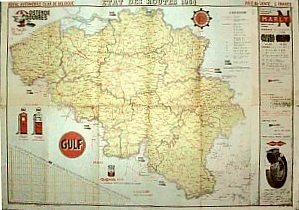 This map carried a large text advert for Gulflube dewaxed motor oil, distributed in Belgium by the French company Spidoléine. Map above shown at 2/3 normal scale. Post-war maps also often carried Gulf adverts, but including graphics of oil cans and petrol pumps, as in this 1954 example. 75,000 copies of the map were printed as a supplement to "Royal Auto", the official magazine of the RACB, although it also carried a sale price of 5 francs. As well as Gulf advertising there was a panel for Marly lubricants, produced by the Huileries du Marly in Heembeek. Conceived for new fuels, they featured added graphite; the company survives to this day as a specialist lubricant supplier. Ets O. de Rycker SA prepared the map itself at 1:400,000 on which the road categorisation had been reduced to just the first 3 states listed in 1934 (so nothing was worse than "en mauvais état"). By 1961 the Gulf advertising had been replaced by Fina; and by 1966 only Marly remained as an oil company sponsor, with a range of other advertisers including, oddly, a mileage chart showing distances from Brussels to 25 towns in Austria. With the advent of autoroutes, road conditions were no longer shown at all, although picturesque routes were marked in green rather than red. Both maps were now credited to J.-E. Goossens SA, and the print run had been reduced to 63,000 in 1961 before recovering to 71,000 5 years later. They also featured many more adverts than the earlier examples. One company that is too small to have ever issued its own maps is Missil (s.a. Socomissil n.v. of Brussels), which has operated a small chain of filling stations since before 1970, and became part of the Patigny group (sold in 2012 to Octa+/Q8). This advert comes from a 1989 town plan of Zaventem and shows that Missil also distributed Agip oils. 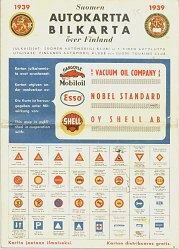 The Finnish Touring Club map published a map in 1939 that carries the symbols of Shell, Esso and Mobiloil. It acknowledges their support in funding the preparation of the map which was available free of charge, and notes that Shell and Esso service stations may be found in "every more important place". This map is notable by containing numerous small plans of towns marking banks and hotels, but not service stations. In 1958, the Total name was still relatively new in the French retail petrol market, despite being controlled by the country's largest refiner, Compagnie Française de Raffinage. 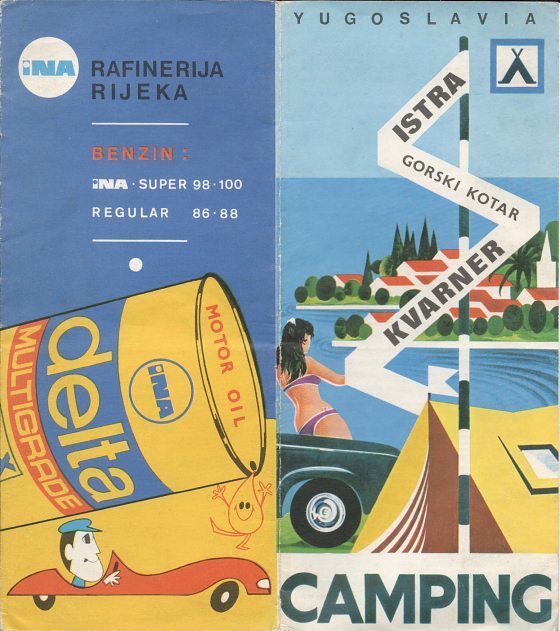 So it is not surprising that they chose to advertise on the rear cover of this map published by the Fédération Française de Camping et Caravanning for motorists taking camping holidays. Blondel la Rougery's map was quite simple with yellow roads on a white background to allow the 305 numbered campsites to be seen clearly. As well as Total, it carried adverts from Nestlé (Maggi dried foods and Nescafé) and Rhovyl fleece (for sleeping bags). Enlarge front and reverse. Jugoslavia first became independent following the break up of the Austro-Hungarian empire. Poor, faction-ridden and outside the European mainstream, the oil market was largely controlled by Shell and Standard, but no oil company issues are known prior to 1945. However, some efforts were made to establish a tourism industry as can be seen from the 1933 map below from the Automobilski Klub Kraljevine Jugoslavije showing 24 black & white photos adverts for hotels around a 1:1,500,000 map of the country prepared by Jugoslovanska Tiskarna v Ljubljani. The reverse side of carries mileage tables and information for motorists in 11 languages (including Russian, Turkish, Czech and Slovak). The English version includes advice that "Roads are fairly good and...the most out of the way places are safe" as well as the instruction "At crossings in cities the following horn-signals should be given: once for straightaway (sic), twice for right turn and three times for left turn". This side also carried adverts for ferry companies and three brands of oil: Socony (Standard Oil Company of Jugoslavia), Mobiloil (Vacuum Oil Company DD) and Shell (Anglo-Jugoslavensko Petrolejsko D.D.). This map is highly unusual in carrying competing adverts for Socony and Mobiloil, which had merged in 1931. In the early 1930s the Dutch motoring organisation, ANWB issued 3 maps covering the Netherlands: sheet 1 was the centre, with sheet 2 the South and Sheet 3 the North. The maps were folded like French Michelin maps, likewise being at 1:200,000 and pasted into card covers. Shell took the rear cover advert on each section (and Philips lamps the inside rear cover), seen from a 1931 map. Enlarge rear image These are sometimes wrongly described on auction sites as being Shell maps. 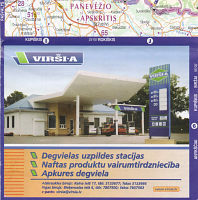 ANWB still publish maps and - briefly - had a small network of own branded petrol stations in the 2000s. Pre-war NAF automobile club maps are shown on the Norway page, as it is known that they were available through the service stations of the brand sponsoring them. 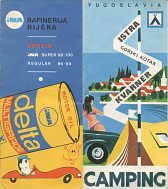 Maps from the Royal Norwegian Automobile Club (KNA - Kongelig Norsk Automobilklub) carried adverts on the rear from the 1930s to the 1960s and, most often, these were for petrol or oil. In the 1930s Mobiloil often provided quite graphic designs as on the 1936 map shown above left, with two more examples (from 1938 and 1953/4) shown on the Overview page for Norway. From the mid-1950s, KNA published a series 6 sheet maps covering the country at scales varying from 1:200,000 to 1:1 million that are relatively frequently seen. A typical front cover design from 1961 is shown centre left; this map covered the fjords from Stavanger in the South to Kristiansund in the North at a scale of 1:500,000, so was popular with visiting tourists. Constrained to using a three colour process, the main petrol companies provided some attractive rear adverts on the rear of the maps. The examples shown here are from Esso (1955), Shell (1957) and Mobil (1961). Later adverts from Mobil (eg. 1964, not shown) were much simpler consisting just of the corporate logo. Post-war maps also carried an advert on the inside rear cover, usually from an insurance company (and often of a bus rolled onto its side). The Norway Travel Association produced maps for free distribution, with the English language title being "Norway by Car". In the late 1950s these were weakly sponsored by BP, but subsequently Esso became the sole sponsor. The 1963 edition of "Norway by car" (below left) contains a map of Norway at 1:1,450,000 with a large Esso logo at the bottom, and legend in English and Norwegian. The reverse is given over to information about six tourist areas with photos; the other panels are given over to a large table headed GO BY SEA TO NORWAY 1963, showing ferry routes from the UK, Denmark and Germany. When folded, the rear (near left) shows the Esso oil drop man and the Happy Motoring slogan, but buried in the blue tourist text is the statement "There are petrol/gas stations all over Norway selling the popular Esso, Shell, BP and Caltex brands" suggesting that the map wasn't wholly under Esso's control! Enlarge front and reverse. This map was presumably produced in other languages for distribution across Europe; a 1966 edition in Finnish is shown (right), which is similar but contains descriptions of more areas, possibly as it lacks the ferry information, which would not have been relevant for motorists coming from Finland. It's not known if Shell ever sponsored the NTA maps, but two Shell-sponsored maps of Oslo are shown on the Norway country overview page. 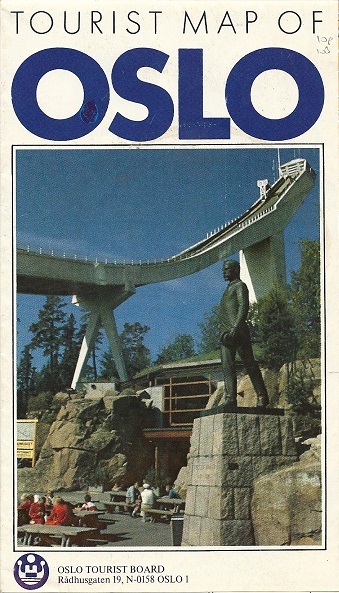 Finally, a much more recent Oslo Tourist Board map. Produced for them by Cappelens on cheap paper in 1986 or 1987, the main street map has an inset box reading "Mobil WE KNOW OIL", but the outer edge panels carry advertising panels for 14 different businesses. Only the two McDonalds restaurants are actually marked on the map. 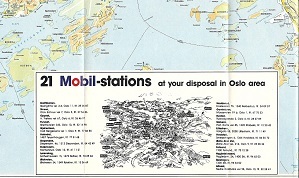 The reverse, however carries a further 9 adverts, including this one for Mobil set inside the Oslo fjord map. Uniquely drawn from an oblique aerial view, it locates 20 Mobil stations by logo, although it is utterly impractical for locating them on the ground (see enlarged images - cover and advert). In the 60s and 70s there were just five brands selling petrol in Portugal: Sacor, Sonap, Shell, Mobil and BP. Although Portuguese maps are known from all five brands, they are uncommon. The Sacor advert (left) came from a 1964 Portugália Editora Guide and Plan of Lisbon and, in English, describes the "net of about 700 SACOR's Service Stations and Refilling Stations at your disposal". After the revolution Sacor and Sonap were merged into Galp, the national oil company. This 1980 ad (right) comes from an Automóvel Club de Portugal map of the Algarve, but similar ones can be found on many ACP maps. Two more recent example of an ACP map, carrying internal advertising for Galp (1985) and the large Spanish petrol company Repsol (2006), are shown on the Portuguese overview page.